You know the drill. Mysterious, seemingly-abandoned location. Haunting atmosphere. Looming tragedy that unfolds through documents you find scattered around. It's a formula that works well for video games in general. As an interactive medium, the scares can be taken to a whole other level in the right hands. The mere fact that you are yourself responsible for the safety of the protagonists is what made games like Resident Evil and Silent Hill infinitely more terrifying and engrossing than their motion picture counterparts could ever be. 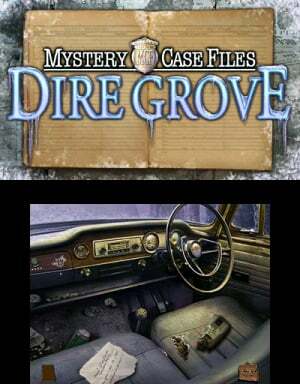 And then we have games like Mystery Case Files: Dire Grove, which reminds us that a clunky interface and conflicting gameplay requirements can trample the scares right to death. The effective sense of foreboding built up by Dire Grove in its early moments is pretty much the only highlight in the entire game. It starts off on absolutely the right foot, but then stumbles embarrassingly to the ground, and only manages to humiliate itself further from there. This game is lousy for many reasons, not least because the concept was pulsing with potential. 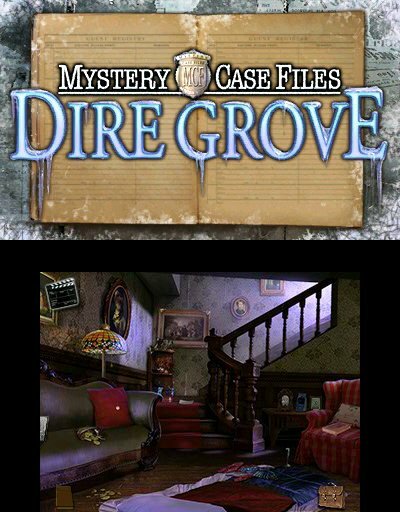 It's a hidden object game, which at this point feels a bit overrepresented in the eShop, but Dire Grove starts off so well that it had a genuine shot at standing out from the crowd. Hot off your adventure in the preceding game, you find yourself trapped on a small country road by virtue of a freak ice storm. Unable to proceed on your way, you decide to investigate another disabled car further down the road. It's here that you find your first video cassette...and get a small taste of what you're in for. The cassette plays out in full-motion video, and there are plenty more to find as well. Admittedly, the acting and production values in these clips suggests that this game tumbled through a time portal from the mid '90s, but the impulse is good. Marrying the hidden object genre to horror is a smart idea, as the long, quiet stretches between puzzles can become unnerving. More specifically marrying it to the "found footage" approach is great as well, as it allows for a wider expanse of characters and storytelling than is typical of games like this. But it's immediately after this that the game falls apart, and it never manages to pull itself back together. A truly terrible design choice makes itself apparent when you try to further investigate the car: a small number of things on any given screen can be interacted with, but most cannot. And if you tap something that cannot be interacted with, you have about a 50% chance of being ejected to another screen. 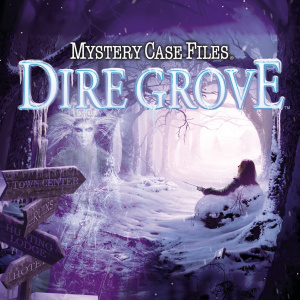 This is frustrating because Dire Grove relies on investigation. Its goals are vague and its clues abstract, so experimentation is mandatory for progress. However since experimentation is accomplished by tapping the touch screen, it's hindered severely by the fact that the game thinks that if you tap something that can't be interacted with, you're trying to exit whatever room you're in. At no point in the development process did anyone realise that players might be tapping these things because they didn't know they weren't interactive. It's a bigger problem than you might think. In one early room you are able to investigate a book lying on a chair and a slip of paper lying on the stairs, but try to investigate a painting hanging on the wall and suddenly you're out of the room and halfway up the stairs. From there you'll notice a note fastened to a door frame. Try to read it, though, and you're teleported into the bathroom. On one hand the game wants to you investigate everything you can so that you can solve the mystery and find yourself immersed in the danger. On the other hand, it wants you to only tap the things you need to tap, and assumes that if you tap something that doesn't need to be tapped you must just want to speed along as quickly as possible. 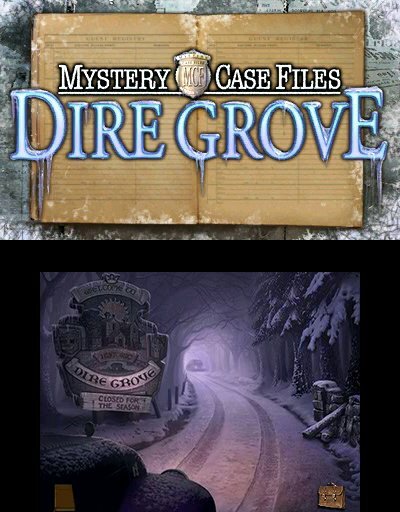 These are two totally opposite game design philosophies, and while it doesn't render Dire Grove unplayable, it certainly renders it unenjoyable. Imagine playing a version of Super Mario Bros. that uses the A button not only for jumping, but for returning to the beginning of the stage. In certain places, A will allow you to jump, but if you press it anywhere else, the game will assume you want to restart the level. That sounds pretty bad, right? Now imagine that there's no way of knowing which areas will let you jump and which will force you to restart. Now you have a pretty good idea of how much fun it is to play Dire Grove. Even when you do want to navigate around, the game fails to provide a sense of understandable connection between areas. In one screen we saw a house in the distance, and tapped the ground near it under the assumption that we could explore it more thoroughly. Instead, we found ourselves suddenly at a bridge over a frozen river. Why? We couldn't tell you. Maybe the bridge was next to the house, but we have no idea, because the first thing we did at the bridge was tap a tire that was half-buried in the snow, and were suddenly transported somewhere else, again. There was no sense at all of what relationship anything we were seeing had to anything else. The hidden object sections — which one would hope might be handled better, since they're the whole point of the game — are equally flawed. In some cases objects pop out of nowhere. For instance, we were at one point asked to locate several items on a screen. One of them was a wreath, which we found and tapped. Suddenly a dog appeared, as though that's what we tapped, and the dog was removed from our list. We tapped the wreath again, and that was removed from the list as well. Was the dog hiding in the wreath? We have no idea, and similar occurrences happened regularly in this game. The necessity of cluttering up the hidden object sections with detritus also works against the game's atmosphere. If you're searching around for something, granted, it should be difficult to find. However when Dire Grove makes it difficult to find by covering the screen with bananas, cartons of Chinese food, and a shocking abundance of stray telephones, it makes the entire experience feel silly. It's impossible to maintain a suspenseful atmosphere when a scary house is suddenly — and irrelevantly — abandoned in favour of an assorted mess of unrelated garbage. Dire Cove also commits the cardinal sin of padding itself out by having you do the same searches several times. There is no point to this at all, and while the list of things to find changes the scene itself does not. It's no more challenging than it was the first time; it's just busy work, which further diminishes the tension. Surely this mysterious terror can't be all that dangerous if you can afford to spend your time looking for marbles, pocket change and miscellaneous tchotchkes over and over again. Other puzzles are inserted into the adventure for the ostensible sake of variety, but they're awfully handled, to the point that it actually becomes comical. In many cases, we don't even know how we solved them, so poorly were the goals conveyed. The earliest occurrence of this had to do with opening a trunk. There were a circular plate and a bunch of conjoined clock-hands scattered around. We figured there was a clue somewhere regarding what "time" this puzzle was supposed to reflect, but since we hadn't come across that clue yet we figured we'd play with it a little bit. We threw every piece onto the circular plate in no particular order, and the trunk popped open. We couldn't begin to tell you why. It felt as though the puzzle itself wanted the game to be over so that it, too, could go off and do something better with its time. Later you'll need to get into the garage. This, too, we solved without knowing how. There was a manhole or something similar in the ground, and we investigated it. We couldn't find anything to do with it, but in the classic spirit of graphical adventure games we tried using every item we had on it. Nothing seemed to work, but one of our items — some little box that the game never identified for us — had disappeared. The manhole stayed in place, but now we were inexplicably one item lighter. When we backed out of that screen, the garage door was open. Whatever we did must have opened it, but we don't even know what we did, nor how the manhole had anything to do with the garage. In terms of presentation, the graphics are a little muddy, but they're perfectly serviceable, and the chilly appearance of the rooms do great work toward building the atmosphere up, so that the puzzles and interface can later tear them down. The soundtrack is excellent; it's far more ambient than melodic, but it suits the mood extraordinarily well. The 3D effect comes into play only to show the game's logo, which hogs the top screen. Every so often video clips or something else will appear in place of the logo, but in those cases the 3D effect disappears, which means it's pretty pointless to turn it on at all for this game. 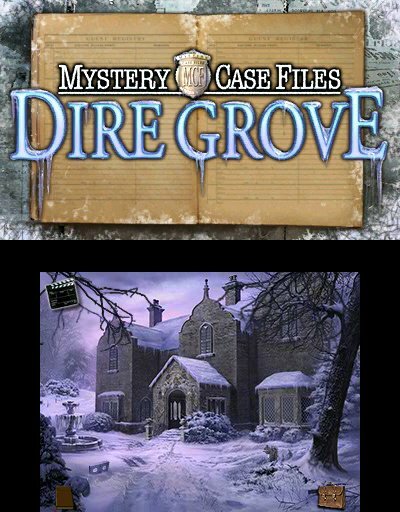 All in all, Mystery Case Files: Dire Grove had a lot of potential. It looks good, sounds great, and builds a genuinely unsettling atmosphere. Unfortunately, this is a case in which the movie would be better than the game, because playing through it is the real nightmare. Mystery Case Files: Dire Grove didn't have to be a bad game, but it unquestionably is. The gameplay is at literal odds with itself, the controls (which consist only of tapping things one at a time) somehow managed to be bungled, and the puzzles seem to solve themselves out of boredom. Not that we can blame them; for a setup and storyline with so much potential, as well as a chilling sense of atmosphere, Dire Grove is an extremely boring and borderline unplayable experience. There's no mystery about this one: it's just not worth playing. The real mystery is why the same screenshot was used 3 times. hahaha. We can only work with what we're given! In the case of both the screenshots and the game, that wasn't much. These subheadings are getting funnier every day! what cracks me up my wife bought this for £1.99 from big fish & Nintendo then puts it on a cart a 100mb I think collector edition is somewhere around 300mb ish. & its over £10 on eshop. Seriously a couple of quid for this yes £5 max but £10 way to much. Then you have all these deals on big fish & they have it for evil apple as well. Time Nintendo stopped letting these people rip off buyers on the eshop. Lol. No way is this a 2/10. I love games like Hotel Dusk and Another Code, and I've always enjoyed the MCF games on Nintendo platforms. If you have similar tastes and were intrigued by this game, don't let this review put you off. The game is easily a 7/10 for me. @Gavin_Rozee is this comparable to Hotel Dusk? I always thought that was a decent, if somewhat flawed, game. This just sounds terrible, I haven't played it though. Great review, really enjoyed reading it. I bought this game from sale before and completed it this week. As fan of games like Shadowgate i actually gave it 4/5 stars. I have N3DS XL so i'm not sure if this game is good with smaller screen.